transmediale was founded in 1988 under a different name as a video art festival and re-born as transmediale in 1998. The festival expanded its focus to a spectrum of media-based art forms, installing the survey exhibition as a festival fixture from 2002 and then, from 2006 onwards, expanded the scope further to encompass a range of work at the intersection of art, technology, and digitality. 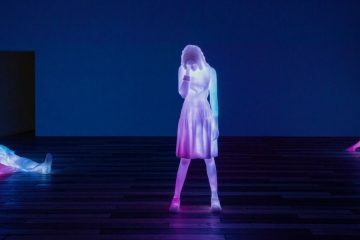 This is significant because over the festival’s more than quarter century history, it has sought to position itself as one of the foremost sites for critical and innovative art and thought on the development of digital culture and technology. With this mantle comes a considerable responsibility to deliver. Indeed there were pieces in the show that seemed to hit the curatorial nail on the head. Erica Scourti’s Body Scan is the strongest work in the show, rightly placed at the entrance of the exhibition. A large flatscreen, hung in portrait format, shows a slideshow of iPhone screenshots and immediately reads as a giant, wall-mounted smartphone; an arresting visual. The mostly unadulterated screenshots are intimately familiar and also intimate in content; it is apparent that a game is in progress, a lovers’ diversion, lying in bed using a similar image app on the clothed and unclothed, intertwined bodies. The artist’s narration is like technological beat poetry, concatenating fragments of text accompanying the algorithmically generated image results into something almost descriptive; beautiful; human. 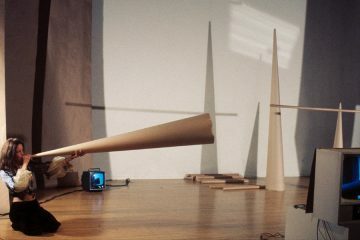 The strength of the piece lies in the artist’s fearless simplicity, her reduction of the visual content to its essence, and the combination with the lyrical voice-over which manages to break new ground beyond the now rather tired question of ‘how machines see us’ to ask how we see ourselves through the lens of our ever-present technological supplements. Effectively book-ending the exhibition is Internet Machine one of the largest positions in the show, by director and designer Timo Arnall. 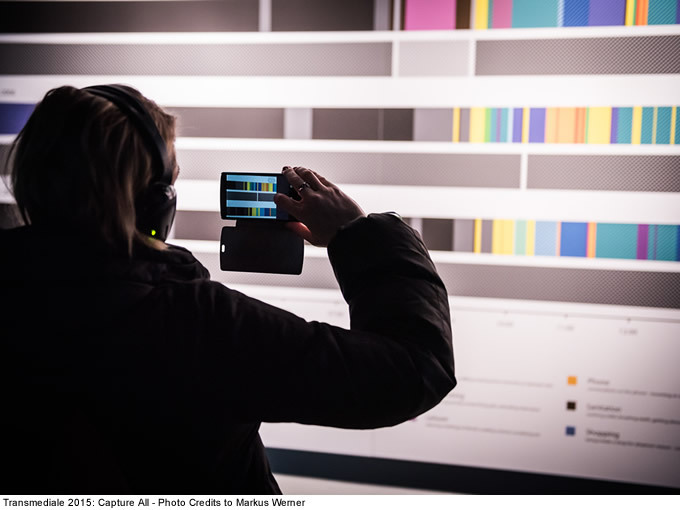 The large format video installation comprises three synched projections; a panoramic, cinematic view inside a massive data centre. The high production value of the piece, elegantly panning through room after room of the enormous, unpopulated server farm is in stark contrast both to the grainy, exposé type imagery we are used to seeing of such spaces, and to the sterile, almost barren or boring character of the physical manifestation of the internet. 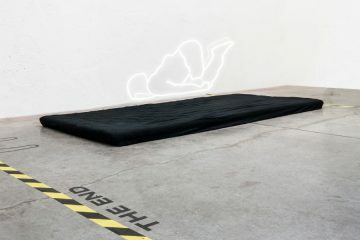 The piece debunks the marketing guff about ‘the cloud’ and the mystification (for political purposes) of cyberspace, whilst underlining the fact that – for the vast majority of us, whose lives are nevertheless braided into these technological spaces and paradigms – the mechanisms behind the net remain a black box. 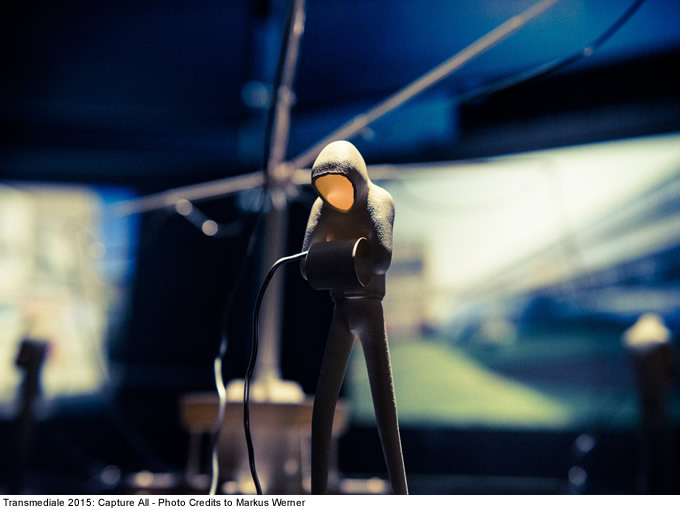 Internet Machine manages thus to be highly political, despite not providing any commentary on the silent footage, and is a crucial piece in the exhibition, designating the internet as an inherently physical construct. In between these two opposite-yet-complementary positions are works that all make for interesting blurbs on the transmediale website, covering concepts from gamification and cyberwar (Eastwood – Real Time Strategy Group, Civilization VI – Age of Warcraft) to musings on a dystopian smart city (Tobias Revell, Mercenary Cubiclists), but which function to varying degrees within the context of a physical exhibition. 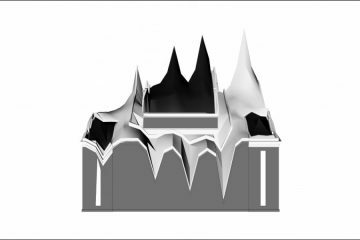 Part of the fault may lie with the seemingly ‘divide and conquer’ approach to the exhibition design. Walking into the exhibition space at Haus der Kulturen der Welt feels more like walking into a stage set. The exhibition design from local ‘star’ studio Raumlaborberlin is based on a repeated hexagonal grid formed using construction fencing and dark mesh cloth; the room is dark, with each artwork spot-lit within a series of interlocking enclosures. The effect may be initially impactful but ultimately means that the works are not in conversation with one another but only with the rather overpowering exhibition design itself. Partly, it is the curatorial focus on datafication and algorithms getting a bit fuzzy in certain positions; Heather Dewey-Hagborg’s work Invisible feels a bit like a token nod to bio art that may have been better left to the workshop program, or to a dedicated stream in a future festival. But above all it is the outdated valorisation of the art object, particularly disheartening from a festival like the transmediale which tasks itself with at the very least reflecting, if not indeed advancing, cutting edge thought and avant garde art. Zach Blas has been doing extremely important work on the intersectional discrimination inherent in biometric facial recognition. As a thinker and maker his place in the exhibition is well-deserved, and yet the presentation of his piece Face Cages – two glossy flatscreens showing minimally moving video portraits of a male and a female face (both white, despite the fact that the work deals explicitly with the fundamental racism in the biometrics industry) wearing the masks Blas constructed based on patterns of biometric diagrams used for facial scanning – highlights the aesthetic at the expense of the conceptual. Extracted from their social and political context, without any accompanying explanatory text or supplementary material in the exhibition, and worn by expressionless faces against a stark black background, the linear silver masks have an element of the decorative that belies the significance of the work. Jennifer Lyn Morone’s work Jennifer Lyn MoroneTM, Inc fares slightly better in that the artist’s project of turning herself into a corporation is evidenced by the inclusion of several framed certificates and an apostille marking her progress through the bureaucratic minefield, making the conceptual underpinnings of the work somewhat more accessible to exhibition goers. 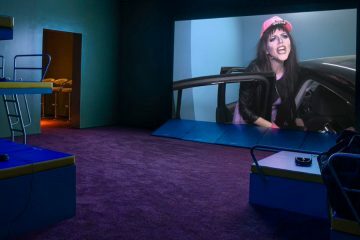 The video work that forms the centrepiece of the position features Morone performing herself as corporation explaining her personal motivations for the project. What is less clear from the physical installation of this epic project, is the lengths to which Morone is going to track, store, own, and monetise all of her own data. It is a definite strength of the transmediale that many of the participating artists are involved in panels where they present their work and expand upon the issues it addresses, and in many instances – including this position – the artist talk was in fact more engaging and informative than the installed work itself. 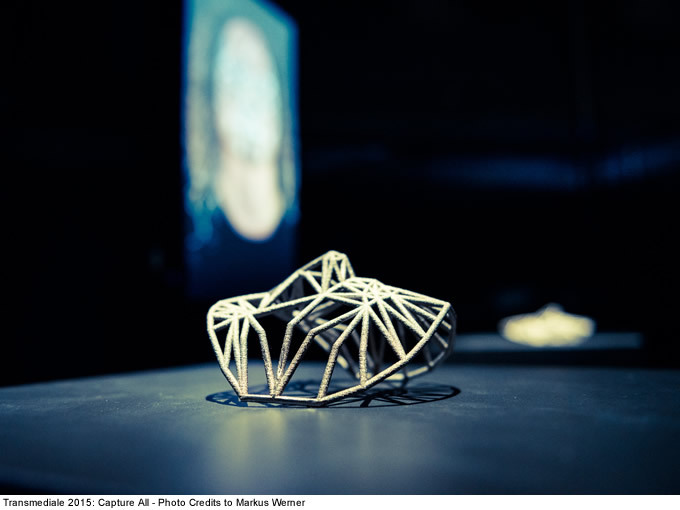 Point in case is Networked Optimization, a collaboration between artists Silvio Lorusso and Sebastian Schmieg. Hearing Schmieg speak about the development of the work, which began with a now defunct page on Amazon listing the most highlighted phrases in books read on Kindle, the meticulously researched and sharply humorous nature of the project is revealed. During his panel talk Schmieg showed an unedited video of a performance based on the project that had been part of a transmediale session the day before: the performer read the highlighted phrases, mostly from self help books, in the manner of a life coach or self help guru in front of an audience, using his authoritative tone to imply sense where there was none amongst the platitudes and banalities. This performance, and the artist’s description of the process, was infinitely more captivating than the physical work, which consisted of three reproductions of books from the list with only the most highlighted phrases visible, lit both from above by the spotlights used throughout the exhibition, and from the front by large photographic lights – for an exhibition visitor it was unclear whether these were part of the work or the infrastructure of the exhibition (it turns out, fascinatingly, that the display of the books, including the lighting set up, was an illegal reproduction by the artists of a patented method of product photography that Amazon exclusively employs). 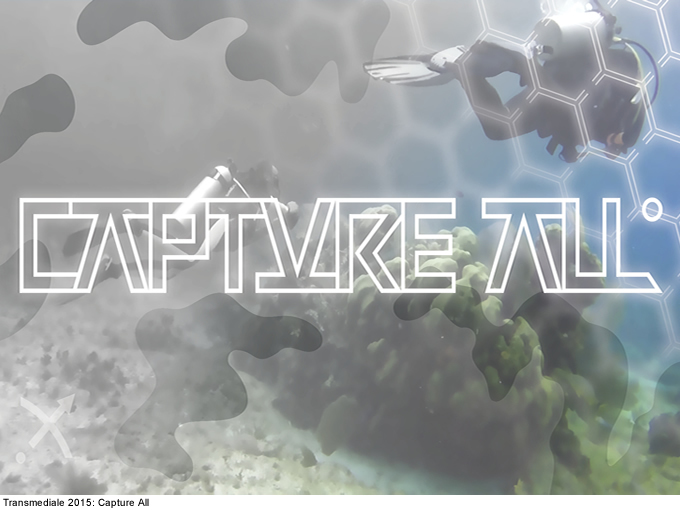 The Capture All exhibition, nestled within a great series of panels, keynotes, and performances forming the program for Transmediale 2015, begs the question as to why vanguard digital, conceptual, and media art is still being exhibited in such traditional ways. Jonas Lund’s piece FTFY (Fixed That For You), created specially for transmediale, nicely fits both the curatorial aims and aspirational quality of the festival. As in previous projects  the artist algorithmically generates new artworks, in this case based on works and texts from previous transmediale iterations, and presents these fictional works as a ‘how to’ guide to making a successful transmediale exhibition in the form of an audio guide through the exhibition space. Lund essentially creates a secondary, invisible exhibition layered over the top of the existing one. Whilst the work seems to be, on two separate levels, pointing to an ‘emporer’s new clothes’ phenomena within the art world, one wonders whether variations on this format might lend themselves to more creative use of exhibition space – both visible and invisible, physical and virtual. A related notion, executed in the exact opposite way is Stakhanov the ‘BigData Oracle’, a supposedly all-knowing data god harvesting social networks and making predictions based thereon, by Art is Open Source (AOS), Oriana Persico and Salvatore Iaconesi. The artist duo gave an amusing, tongue-in-cheek performance with Stakhanov at the opening of the festival, and the cheeky irony of the work was rightfully well-received in that format. It is, then, utterly anticlimactic to see the physical installation of the work: a few pseudo-religious flags hanging above a dot matrix printer constantly spewing out what are putatively complex predictions based on data mining. The privileging of object over performance, the underlying assumption of the necessity of a physical installation within an exhibition format, seems jarringly at odds with the festival’s themes of the digitization of society, the expansion of the virtual realm, the role of art as a demiurge or agitator for change. Ultimately, it is not a problem specific to the Capture All exhibition, which brought together a number of interesting pieces and even more interesting artists, but a broader challenge which is facing contemporary artists – or, perhaps, first and foremost contemporary curators – to find exhibition formats that match the content of the works in their innovation and creativity. Or, at the very least, that aren’t at cross purposes to the artworks, and perhaps make some of the more complex concepts accessible to a broader audience.